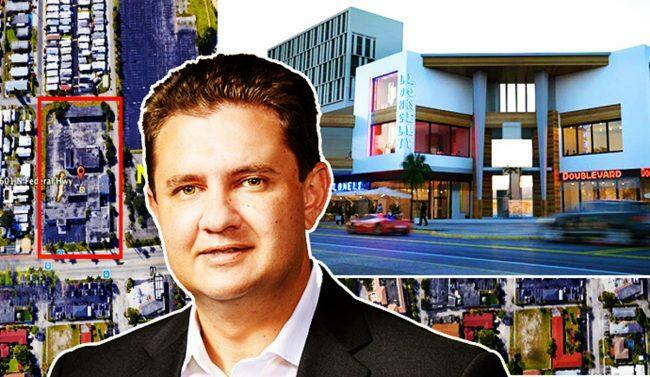 UPDATED, Oct. 18, 12:25 p.m.: Grupo Eco just paid $12 million for land in Hallandale Beach where the Mexican development group plans to build the final phase of its mixed-use Atlantic Village project. A company led by investor Maxime Rémillard sold the 2.5-acre property at 601 North Federal Highway. Records show Rémillard paid $6.9 million for the site last year, which means he just sold it for about $5 million more than what he paid. John DeMarco of Re/Max 5 Star Realty had the listing. He also brokered the property’s two previous sales. The site was home to a Kelly Chevrolet dealership that went out of business in 2013. Grupo Eco financed the deal with an $8.25 million loan from New Wave Loans Residential, according to property records. Grupo Eco co-founder Alejandro Chaberman said phase one of Atlantic Village at 801 Federal Highway is completed and is leased to Venezuelan Doggi’s Arepa Bar, Peruvian restaurant Dr. Limon, a Casa De Montecristo cigar bar, and Flippo’s Kid’s Playground and Cafe. The businesses are set to open in about a month, Chaberman said. Phase two is under construction and will include a 25,000-square-foot commercial center along North Federal Highway, and a six-story, 18,000-square-foot office building with ground-floor retail space. Asking rents for the ground-floor retail space average about $48 per square foot. Rents on the second floor average $30 per square foot. The second phase is expected to be completed by the first quarter of 2020. The third and final phase calls for three buildings totaling about 200,000 square feet, one of which will be a seven-story, rental building with about 100 apartments. The developer also wants to build another boutique office building and commercial and retail center. The total cost of the entire project is between $80 million to $90 million, Chaberman said. Grupo Eco begun construction of Atlantic Village in 2016, after acquiring land in mid-2015 for $10 million from Tibor Hollo, the founder of Florida East Coast Realty. Earlier this year, developer Jeffrey Soffer paid $12.5 million for the Mardi Gras Casino, which lies just east of Atlantic Village.